Our object this week pulls back the curtain a bit on APH manufacturing processes. It is the mold for the tactile globe we introduced in 1986. 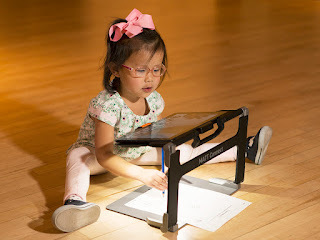 APH has a long history with tactile maps. Our first maps in the 19th century were hand carved from wood, but in the 1930s we began casting them in early plastics. APH began manufacturing 12" globes in 1959. Originally, the tabletop globes rested in a wooden cradle, but this model was designed for an aluminum stand. The plastic parts of this globe were manufactured, painted, and assembled right here in Louisville. The aluminum parts were purchased from the G.F. Cram Company, a major globe maker in Chicago. This mold—a work of art in itself--was designed and fabricated in the APH model shop by master model maker Tom Poppe, circa 1985. The first photo: Epoxy mold for the 12” relief globe, two recessed hemispheres inside a red frame. 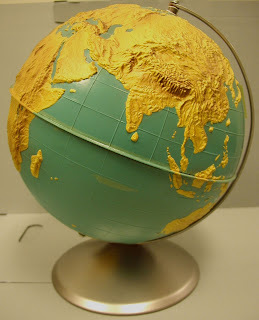 The second photo: A finished 12” relief globe on its stand, water is light blue and the land is yellow with brown highlights.